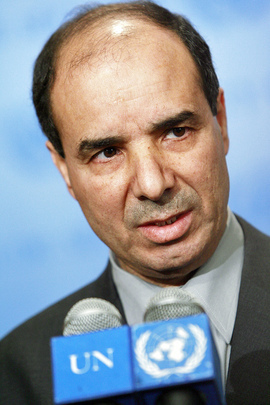 As Libya UN Deputy Slams Gadhafi, Murabak Rep Remains, Bahrain to Decide? UNITED NATIONS, February 21 -- Even as Mubarak fled Egypt, his Ambassador at the UN Maged Abdelaziz kept his job, even though he was a quasi Cabinet member. But with Colonel Moammar Gadhafi teetering but still in Libya, his Deputy Ambassador at the UN Ibrahim Al Dabashi called for him to step down. First he was quoted "After we have seen what is happening in Libya and after the kind of declaration of war against the Libyan people which has been declared by the son of Qaddafi yesterday, we find that it is impossible to stay silent and we have to [convey] the voice of the Libyan people to the world. First let me say that we state clearly that the Libyan mission is a mission for the Libyan people." What about Yemen's mission? The Yemeni Permanent Representative to the UN is known to be looking for a UN job. Or the mission of Bahrain, where a protest is scheduled for February 22? 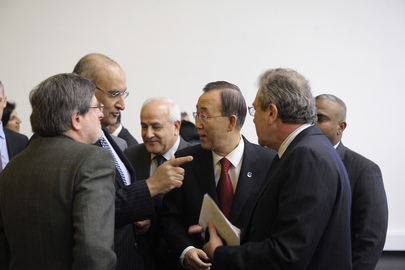 Al Dabashi is well known to the UN Press, from when Libya was on the Security Council. 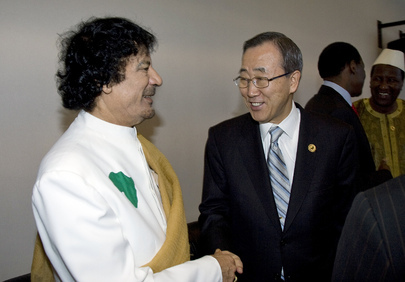 But if the UN still recognizes Gadhafi, as made clear by Ban Ki-moon's belated telephone call to him, who now represents Libya at the UN? Watch this site.